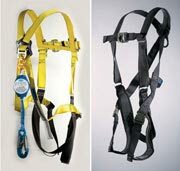 FULL BODY HARNESS YOU CAN TRUST! 96096BFPT FULL BODY HARNESS TOWER WORKING TYPE. 6 D-RINGS. PADDED SEAT, PADDED WAIST WITH TONGUE BUCKLE LEGS.